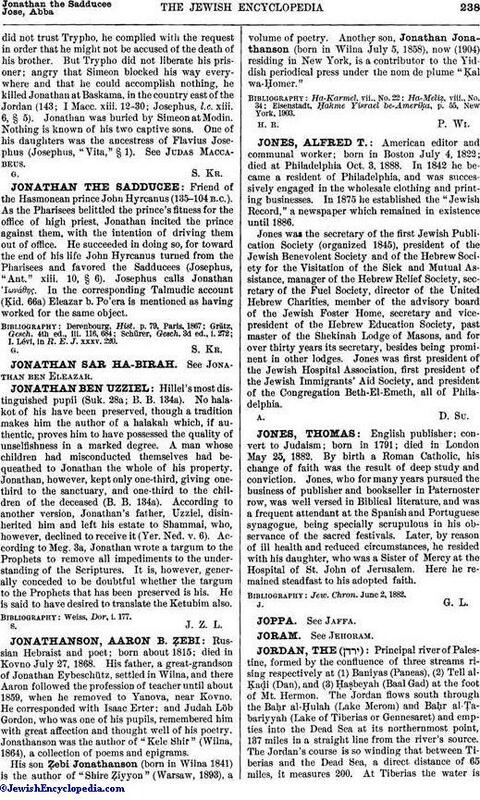 English publisher; convert to Judaism; born in 1791; died in London May 25, 1882. By birth a Roman Catholic, his change of faith was the result of deep study and conviction. Jones, who for many years pursued the business of publisher and bookseller in Paternoster row, was well versed in Biblical literature, and was a frequent attendant at the Spanish and Portuguese synagogue, being specially scrupulous in his observance of the sacred festivals. Later, by reason of ill health and reduced circumstances, he resided with his daughter, who was a Sister of Mercy at the Hospital of St. John of Jerusalem. Here he remained steadfast to his adopted faith. Jew. Chron. June 2, 1882.